The recent discovery of one-meter-tall "hobbit" skeletons in Indonesia is one of the most shocking finds in the history of paleontology. Now there's hope that DNA extracted from a preserved tooth might unlock the secrets of these hobbits. This strange species, classified as Homo floriensis, does not fit easily into our current understanding of paleontology. A popular theory is that they are closely related to Homo erectus which left Africa for Eurasia over a million years ago. For whatever reason, this particular branch of the species evolved to become far shorter than their counterparts elsewhere. Another theory states that these are regular Homo erectus who just happened to be little people, and so aren't actually a separate species at all. This theory isn't generally accepted by experts, however. But some researchers, including Peter Brown of Australia's University of New England, favor an even more dramatic explanation. They don't just think Homo floriensis is part of a new species — they argue that these hobbits aren't even part of the Homo genus at all. 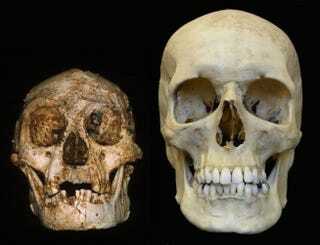 Instead, they are relatives of other pre-Homo hominids, such as Australopithecus. That would explain their much smaller stature, and there's some evidence to suggest that their bone structures far more closely resemble those of Australopithecus or even chimpanzees than members of the Homo genus. The problem with that theory is that it doesn't fit with our currently understanding of humanity's evolutionary history, which says all hominids remained in Africa until the emergence of Homo erectus. The idea that Australopithecus or another pre-Homo species migrated all the way from Africa to Indonesia is, if not impossible, then definitely an extraordinary claim that requires extraordinary evidence. What we currently know about the hobbits doesn't count as extraordinary evidence of any theory. That's where DNA extraction enters the picture. If we can scrape together some examples of hobbit DNA, then we could compare it to our records of other species and hopefully work out where they fit into the larger evolutionary picture. But finding DNA isn't easy. In general, teeth are the best bets to find examples of preserved DNA, but specimens need to be kept in consistently cold conditions for DNA fragments to survive. And "consistently cold" isn't generally used to describe the climate of Indonesia. Five years ago, a couple of teams tried to extract DNA from hobbit teeth, but these attempts failed. Now a team at the Australian Centre for Ancient DNA thinks they've figured out the mistakes their predecessors made, and they are optimistic they can have more success by using lower drilling speeds that are less destructive of the teeth and by focusing on the outer coating of the teeth. This outer layer actually has richer sources of preserved DNA than the center of teeth, which is where previous efforts had focused. Many experts are still skeptical that these new efforts will have any more success, if only because the Homo floriensis teeth have likely been exposed to too much high temperatures for any usable DNA fragments to survive. Still, there's a real chance that we're closer to figuring out just what on earth is going on with these ancient hobbits.